Measles is a very infectious and potentially serious illness that is caused by a type of virus called paramyxovirus. It is spread from person to person by coughing, sneezing or sometimes kissing. Measles outbreaks still occur in Australia, usually starting with a measles infection in an unvaccinated traveller returning from overseas. Symptoms will usually begin to show 10 to 14 days after infection with the measles virus. a rash, which usually appears several days after the other symptoms and lasts for about 5-6 days. The blotchy red skin rash usually starts behind the ears, and then spreads to the face, the body and then to the arms and legs. Measles is caused by a virus – a paramyxovirus called Morbillivirus. In infected people, the virus can be found in respiratory secretions (mucus in the nose and throat), and is spread from person to person through coughing and sneezing or close personal contact. Measles is highly contagious – the virus can live for up to 2 hours in the air, or on surfaces such as furniture and door handles. Your doctor will ask about your symptoms, whether you have recently been exposed to anyone with a rash or fever, and if you have recently travelled overseas. Your doctor will also do a physical examination, looking especially for a rash and for Koplik’s spots. How long am I infectious for? 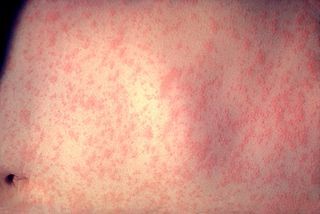 A person with measles is infectious for 2-4 days before the rash appears (when there may be symptoms of fever and tiredness), and for up to 4 days after the rash has appeared. You should stay away from childcare, school or work during this time. There is no specific treatment available for measles. Treatment involves self-care to manage symptoms, rest and drinking plenty of fluids to avoid or treat dehydration. As measles is caused by a virus, treatment with antibiotics will be of no use. However, antibiotics may be offered if a bacterial infection (such as pneumonia or an ear infection) develops as a result of having measles. Paracetamol or ibuprofen will help to reduce the fever and control headaches. Follow the instructions on the bottle. Never use aspirin for children or teenagers, and do not use paracetamol for more than a few days without consulting your doctor or pharmacist. When your child has a fever, dress them lightly, and cover only with a sheet. If they feel cold and shaky, cover them up until the shakes stop and they feel comfortable, then remove the clothes and blankets again. Wash sticky or itchy eyes with a mixture of cooled, previously boiled water (500 mL) and salt (1 teaspoon). Use disposable eye make-up pads or a very clean flannel to do this. If the sticky pus around the eyes turns green or dark yellow/cream, take your child to the doctor as they may have developed a bacterial infection and require antibiotics. people who have a weakened immune system or an ongoing (chronic) illness. Antibiotics may be needed if a bacterial infection (such as pneumonia, bronchitis or an ear infection) develops. have not passed urine for 10 hours. A vaccine against measles is available, and forms part of the routine vaccination schedule recommended for all children in Australia. Vaccination against measles provides lifelong immunity. MMRV – measles, mumps, rubella and varicella (chickenpox). Side effects following MMR vaccination are generally mild, and may include mild fever and rash. All adults and adolescents born during or since 1966 (especially healthcare and childcare workers) should check that they have been vaccinated against measles. Vaccination is recommended for unvaccinated people who are planning overseas travel. Vaccination may also be recommended for people who are not immune to measles and have been exposed to the disease. Measles vaccines should not be given to people who have problems with their immune system, pregnant women, and to people who have had an anaphylactic reaction (severe allergic reaction) to previous immunisations. If you have been exposed to measles and are not immune, there are measures that can be taken to either prevent measles developing or, if measles does still develop, to reduce the length and severity of the illness. Immediate measles vaccination (within 72 hours of exposure) can help prevent measles infection in non-immune people (those who have never been vaccinated or never had measles). Normal human immunoglobulin (NHIG) can be used to prevent or modify measles in non-immune people if given within 7 days of exposure. It contains antibodies to measles and is given by injection. It is generally advised for people with poor immunity, those who cannot have the measles vaccine, and those at increased risk of complications. If you or your child have not been vaccinated or have poor immunity and have been exposed to measles, contact your doctor urgently to obtain advice. 1. Australian Government Department of Health and Ageing. The Australian Immunisation Handbook, 10th Edition 2015. 4.9 Measles (updated 16 Jul 2015). http://www.immunise.health.gov.au/internet/immunise/publishing.nsf/Content/Handbook10-home~handbook10part4~handbook10-4-9 (accessed Sep 2015). 2. Immunise Australia Program. Measles (updated 20 Apr 2015). http://www.immunise.health.gov.au/internet/immunise/publishing.nsf/Content/immunise-measles (accessed Sep 2015). 3. World Health Organization (WHO). Measles (updated Feb 2015). http://www.who.int/mediacentre/factsheets/fs286/en/# (accessed Sep 2015). 4. Centers for Disease Control and Prevention (CDC). Measles for healthcare professionals (reviewed 3 Nov 2014). http://www.cdc.gov/measles/hcp/index.html (accessed Sep 2015).